I’m not sure where I picked that concept up from, it’s probably a variation of a famous quote whose author escapes me. But for me there is a lot of truth to the statement. When you find out the last book someone read you can tell a lot about them. When you get them talking about it you can gain incredible insight into who they are and what motivates them. In my case I picked up a book at the airport for my flight and to help me get into trainer mode. 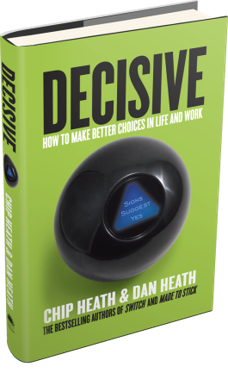 The book I picked up was Decisive, a business management and leadership book by the Heath brothers. It was on the top of a lot of 2013 lists and I had heard of it before. Once I started reading it, I quickly saw some key points I could roll into my next analytics training class. > Most decision are made in an instant and are often just a choice between two options. > Although helpful, Pro and Con lists are limited in their effectiveness. > Most business decisions, when looked at a few years later, were failures. 1. Widen Your Options by eliminating factors that put artificial limits on our choices. 2. Reality-Test Your Assumptions by taking them out of our head and into the real world. 3. Attain Distance Before Deciding, which means don’t rush and gain other perspective. 4. Prepare to be wrong, the willingness to take risks is a challenge for all of us. Its a great read, pick it up. Posted on May 19, 2014 November 8, 2016 by DMAIPHPosted in Analytics Consulting, Analytics Culture, Analytics Training, Business Strategy with Analytics, HR & Recruitment AnalyticsTagged Analytics Training, Dan Meyer, decision-making, Decison-Making, DMAI, DMAIPH, Good Decisions, Marketing, marketing analytics. Next Next post: What Exactly Are Recruitment Metrics?